Union Gen. William T. Sherman’s army marched slowly through this area on March 9, 1865. Low land and heavy rains required the construction of corduroy roads that consisted of saplings, trees, and fence posts laid lengthwise across the makeshift highways. They helped to support Sherman’s 60,000 Federal soldiers and foragers, or “bummers” as they were called, as well as supply wagons and artillery. army as it moved from Laurel Hill to Fayetteville. The Temperance Hall to your left was built in 1860. Passing troops allegedly shot off the upturned chalice (symbol of temperance) and Bible, but left undisturbed a mill house near the pond behind the hall. Near here, Confederate cavalrymen began reconnoitering the Federal advance before the Battle of Monroe’s Crossroads. 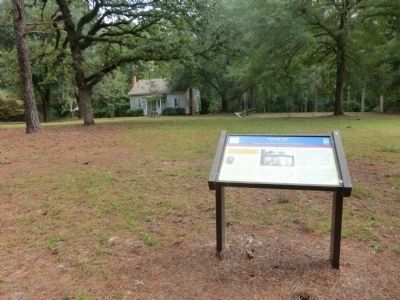 A small skirmish occurred here as the Confederates intensified their reconnaissance. Sherman’s XV Corps crossed the Lumber River on the Gilchrist Bridge at the site of the present-day U.S. Route 401 span. “March 9, moved fourteen miles to Bethel Church. Crossed the Lumber River on a pontoon (bridge). Entered the Big Raft Swamp, (Supply) trains could not get up by night and the general and staff slept in the church. The supply trains were scattered along the road clear back to Laurel Hill. All the available troops were employed in making roads. Next day we remained in camp waiting for the trains to close up.” – Col. Michael C. Garber, Chief Quartermaster, Army of the Tennessee. of a tempest.” – Charles E. Benton, As Seen from the Ranks: A Boy in the Civil War. Location. 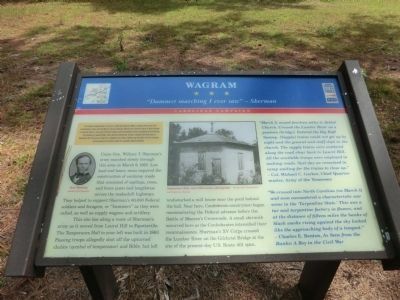 34° 53.034′ N, 79° 23.316′ W. Marker is in Wagram, North Carolina, in Scotland County. Marker can be reached from Spring Hill Road north of Old Wire Road (North Carolina Highway 144), on the right when traveling north. Touch for map. 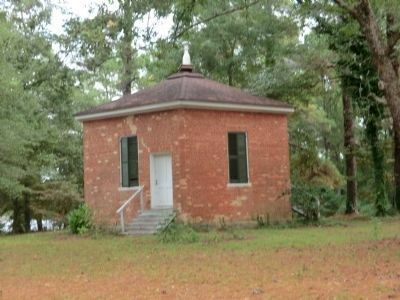 Marker is in this post office area: Wagram NC 28396, United States of America. Touch for directions. Other nearby markers. At least 8 other markers are within 8 miles of this marker, measured as the crow flies. Spring Hill Baptist Church (a few steps from this marker); Gerald Johnson (approx. 1.1 miles away); John Charles McNeill (approx. 1.1 miles away); Temperance Hall (approx. 1.1 miles away); Sherman's March (approx. 5 miles away); Old Laurel Hill Church (approx. 5.7 miles away); World War II Glider Pilots (approx. 6.1 miles away); Laurinburg Institute (approx. 8 miles away). Touch for a list and map of all markers in Wagram. More. Search the internet for Wagram. Credits. This page was last revised on June 16, 2016. This page originally submitted on November 22, 2013, by Don Morfe of Baltimore, Maryland. This page has been viewed 429 times since then and 15 times this year. Photos: 1, 2, 3. submitted on November 22, 2013, by Don Morfe of Baltimore, Maryland. • Bernard Fisher was the editor who published this page.